We've got some exciting news for our children's ministry for this fall quarter. Right now our children's ministry team are putting their brains together to take over the world.....uh, I mean plan some exciting events for our children this fall! Stay tuned for more news. Starting off, we want to let you know about our new Sunday worship experience designed to engage kids hearts and minds in worship to the Lord. Starting off on Sundays, kids will meet in the Fellowship Hall to begin an hour of Explore the Bible Kids where they will work through books of the Bible learning things like: where is this book in the Bible, what does this book mean for me, how does this book point me to Jesus? Your child will have fun with Bible study, games, and hands-on activities that teach them the truths found in God's Word. Our new classes will be broken down into the following age groups: Pre-K - 1st Grade, 2nd Grade - 5th Grade. Kids will also be studying the same lessons from our nursery up through our young adult class. We even have one adult class (Shirley Graham) that will be studying the same material, so your family can all be on the same page together. There is even a family Bible reading plan that we will post every quarter that you can use for your family devotions. During each worship service, we aim to teach kids from the earliest of ages to be a part of the worship service. Every Sunday after Sunday School is over, your child will be taken with their Sunday School classes to sit on the front two rows in the sanctuary and sing together with the congregation as we worship. They can even sit with you during this time and either stay for the whole service or leave with the other children after the choir special. We will have a special Kids Worship time that continues the lesson from the Sunday School our in a special worship format that meets in the Fellowship Hall. As your child gets older, you may find that they do better continuing to worship in the main service as the children's worship service is particularly targeted towards our younger children. It is our desire to see kids engage in worship with their families rather than be isolated from everything else that is going on in the church. For this reason, the last Sunday of every month is Family Worship Sunday. On Family Worship Sunday, we encourage your family to sit together, sing together, and worship together. Sermons will be adapted to be "kid friendly." We encourage you to help your child on these Sundays by showing them how to worship and taking time to explain the different parts of the worship service. And, it's totally okay to talk during the service to explain something to your child! Don't miss out on what we have planned for Sunday evenings! While the adult worship service is going on in the Sanctuary, kids will meet in the Fellowship Hall to explore What's In the Bible with Buck Denver. 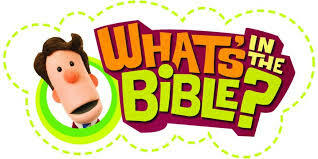 Kids will also learn more about this wonderful book we call the Bible. It's loaded with lots of fun! Midweek for kids is a chance to serve. Kids will learn about missionaries who are on the field serving right alongside their families all over the world and how they too can be involved in their own backyard. We have 4 classes that meet: Mission Friends, GAs 1-3, GAs 4-5, and RAs. These groups will also participate in mission projects throughout the year.